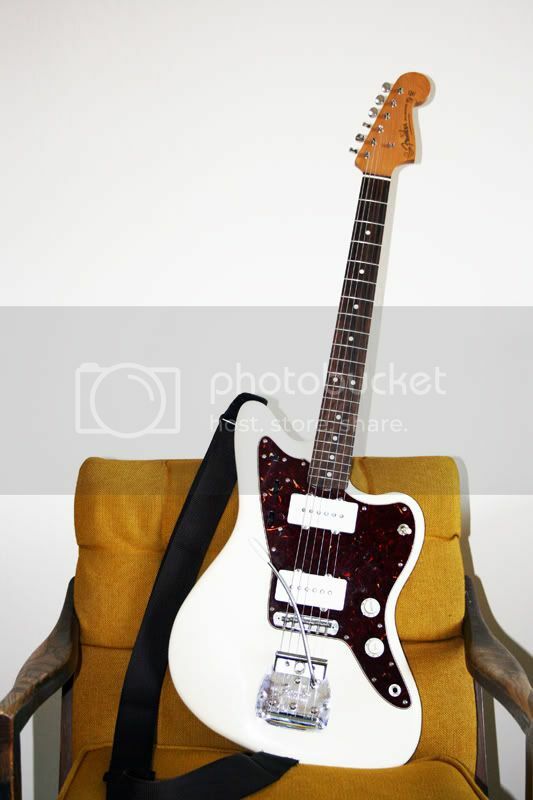 why did I wait so long to buy a Jazzmaster? Discussion in 'Guitars in General' started by Zounds Perspex, Jan 30, 2012. Gah, I've loved so many bands that use them - Sonic Youth, Dinosaur Jr., My Bloody Valentine, Yo La Tengo, plus tons of surf stuff - but never picked up one. I didn't want to hero worship or tip off people as to my influences too much, plus I guess I never found the right one. But after playing a buddy's JM with a '58 with '63 neck, I looked and looked, and then found two! A killer partsmaster I traded for here, and another AVRI in a local pawn shop. SO KILLER. best clean sound I've ever gotten from a solidbody guitar, brilliant trem - I know it's not for everyone - the most comfortable body shape ever - so good! I'm just crazily loving these guitars. 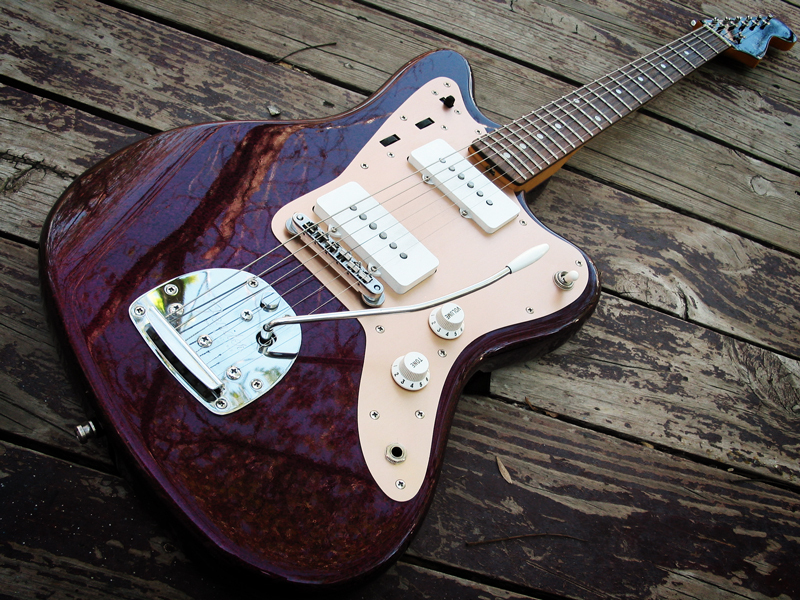 And tomorrow - LPB '65 Jazzmaster coming my way! Woohoo! so who else loves 'em? And what guitar did you dig from a distance but not pick up for a lot of years, and then found it was perfect for you after all? is this thread worthless without pics? this one was built by forum member Drewski - plays so great! this guy needs a little love, but I think has some great potential. feel free to mock my monster toys, btw. I used my JM Saturday night, and it looked and sounded great. I hadn't taken it out in a long time, but it was a perfect first set guitar. We had to be a little quiet first set in this place, and it was ideal for stuff like "Into The Mystic," "When Will I Be Loved," and "Secret Agent Man," where I did the trem bar surf bend stuff on the Em and Am chords. Second set, I broke out the 60's SG Special and the Rick 12, but the JM will be coming out again next weekend. I always like the idea of a Jazzmaster-aesthetically-but the bridge/trem combined with light gauge strings was pretty much a frustrating experience. 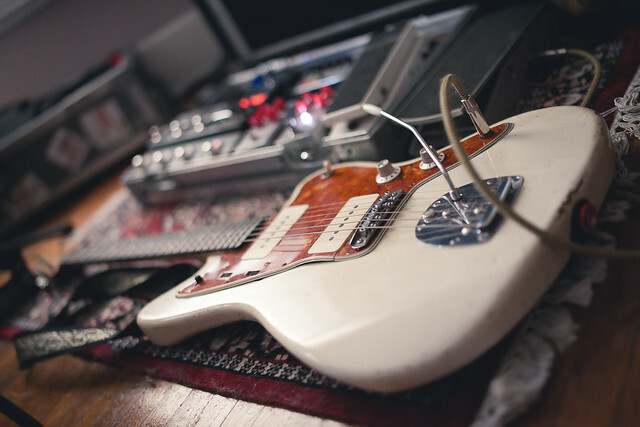 Then Fender did the sensible thing and released the Classic Player series Jazzmaster with a Tune-o-matic type, increased the break angle over the bridge and solved the problem. I'd love one when funds allow. Reissues/originals just don't work for me. They started production in '59. There are a could '58s floating around. 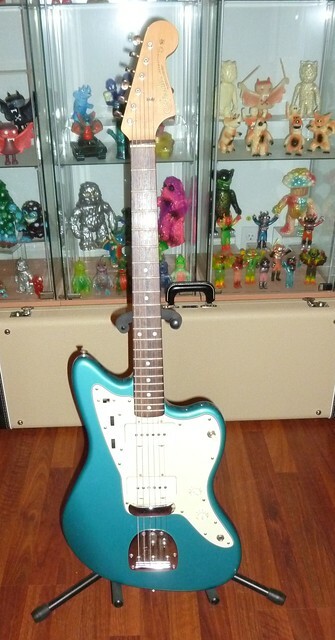 don't have a lot of experience with jazzmasters but dude your Japanese Monster toy collection looks really awesome. looks like you have some pretty obscure stuff like the Matango piece and some cool Ultra monsters as well. i collect ultraman and godzilla stuff as well. oh and the guitars look pretty sweet as well. I don't know. Why did you? Picked up a super clean Nov 62 lam board earlier this year for about $1500 below market value. Amazing! About the fenderiest sounding Fender I could imagine, great neck, may swap out bridge, but have been using it a ton! It might just be an optical illusion caused by the warped guard, but are those pickups flush with the body? How does that sound? oooh, a man after my own heart...! my '63. Really great guitar. Sounds fantastic plugged into anything. So glad youre diggin the jazzy! I told you it was a good one!